The coast defense gunboats Pisagua and Chipana have joined the Coastal Defense Group of the Southern Naval Command at Mollendo-Matarani, where they will take up their duties. Their operational training period has completed and they are now in full commission. 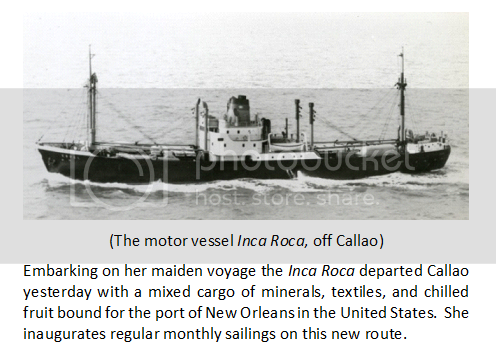 The first of several cargo vessels under construction for Empresa Nacional de Navegaceon, the motor ship Inca Roca, has been delivered to her owners, and it is expected that she will enter service later this month. The last several days have seen a number of major steps forward in the renovation of the Marina de Guerra del Perú. On 13 November the frigates Catalano and Chunchoa completed their initial operational training and formally joined the Segunda Escuadrilla de Escoltas at Mollendo-Matarani, while on 17 November their sister vessel Canseco was completed at the Servicios Industriales de la Marina shipyard at Callao. That same day the gunboat Parinas was formally commissioned as part of Grupo de Acción Naval 1. For Father Alvaro Diaz Mego this day would remain a highlight of his life – the first services to be held in the church he had labored for so long. Prior to the arrival of Capitán Gordon Magne and his soldiers he could but try to keep the faith alive among the peasantry in whose souls remained vestiges of the beliefs of their ancestors. Today the church, “his church” – for his was a Franciscan – was the focus of a growing community. Compared with the cathedrals of any of Peru’s great cities it was quite unprepossessing – a floor of poured concrete, walls of boards and battens, and a tin roof – the bell which rang for services stood outside; no bell tower had yet been built – and one would not for many months. The decorations of the altar were simple, but the craftsmanship of the people of the district was shown in the carvings and other fittings. As the small nave filled with the residents of his parish, and with the soldiers who had contributed so much to the work being done here, he was truly thankful for all that had transpired in the last two years.